Fantasy Battles & cool stuff..: Transformers , Yoda , Gollum , power rangers watch them battle it out. Transformers , Yoda , Gollum , power rangers watch them battle it out. Well guys I,m glad you all enjoyed the fantasy battle between Optimus Prime vs The Power rangers. I,ve got a troop of demented Klingon's working on some other great matchups for you guys to decide who you wanna see get it on in the next fantasy battle. Remember if you have any ideas on what matchup you would like to see, let me know and I,ll include them on the next post for everyone to decide if they would like to see that battle or not. Well since Fantasy battles has got more and more popular Ive had some strange contestants wanting to enter a fantasy battle. 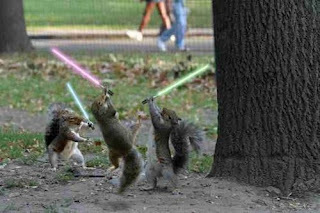 First up I had an Email from these guys the Sith Squirrels who have been practicing hard every day and they sent me a pic from their secret Sith Squirrel training camp and want to take on Yoda. I contacted Yoda and his reply was "Nut burying leads to anger , anger leads to squirells with lightsabers , squirrels with light sabers leads to....... Drunk too much I think I have , lie down now I think I will." Which I thought was fair enough..
Also since Gollum had his famous fantasy battle with Yoda , he dropped me a quick Email from Hollywood where he said he,s doing just great , and his ring is now fine. In fact since his appearance on Fantasy Battles he has turned over a new leaf. So guys let me hear your suggestions on who you would like to put forward for the next fantasy battle? Whether its the Sith Squirells vs Yoda or anyone you can think of. I will bring you your suggestions plus some others for your to pick who you would like to see battle it out next very soon. The Best amateur Lightsaber battle on the web.